Lions are not the first animal that comes to mind when you think of an inland Delta, but the Lions of the Okavango have adapted to their wetland habitat, and often take to the water in pursuit of their prey. Lions are of course one of the Big Five and are an iconic symbol of a safari, and their powerful roar can be heard over 5km away. These large tan cats are hugely social animals that live in groups called prides. Prides can have between 3 and 30 members in them. 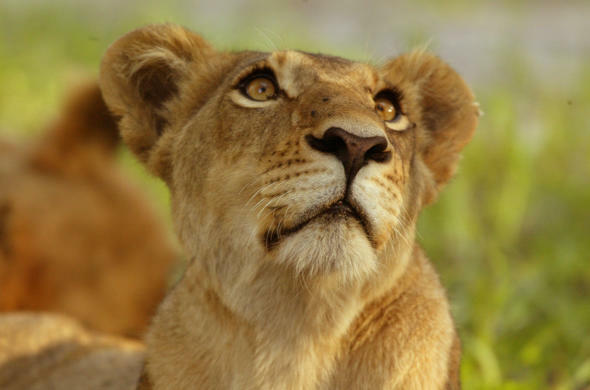 They usually prefer the open savannahs, but there are Lions found in desert conditions and the swamps of the Okavango Delta. 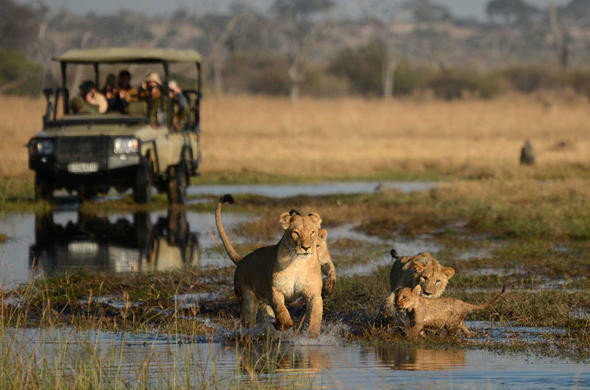 Lions are found in most areas of the Okavango, including swampy areas where you might not expect to see them. 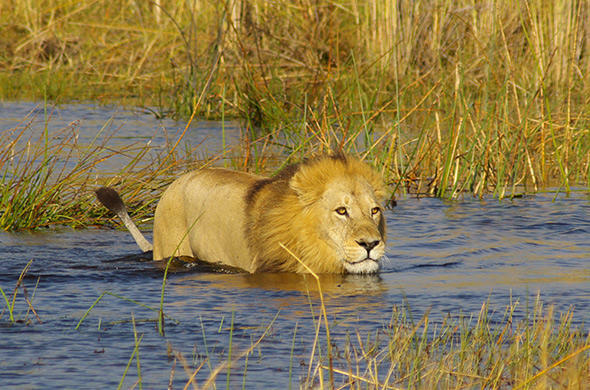 In fact Lions in the Okavango have learnt to swim in pursuit of their prey. 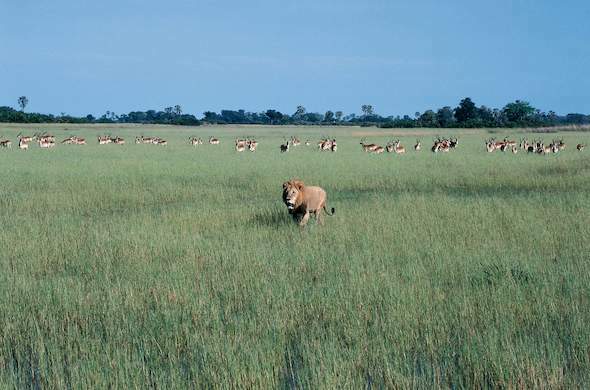 As a result many prides in the Delta have move developed fore quarters due to all the swimming they do.There are two prides of Lions that live in the Duba plains region that are in a continual battle with a large herd of Buffalo that number many thousands. Buffalo are generally the favourite prey of Lions, and rangers have a common saying that 'where there's Buffalo, there are Lions'. The Lions of the Duba Plains have developed the habit of hunting during the day, which is unusual, as most Lion hunt at night. Another famous pride of Lions was from the Savute region. This pride became famous because they learnt to hunt Elephants. Elephants were generally thought to be above predation other than when they are small. This large pride of 30 Lions learnt to work as a team to bring down large Elephants when other prey was scarce. However, the Savuti River has started flowing in recent years, and easier prey has moved into the area. The pride has split into smaller groups and the Elephant hunts seem to have stopped for now. Lions are not generally known to be good climbers, maybe having a half hearted attempt to steal a Leopards kill from where it has been hidden in the fork of a tree. Several Lions have been seen climbing trees in the Okavango and using the branches as a vantage point to look across the Delta.